Along my Tea Journey I found that intentional planning, planning to reach your highest potential, keeps you focused on your goals. So this weekend I thought I would share my favorite planner kit subscriptions. 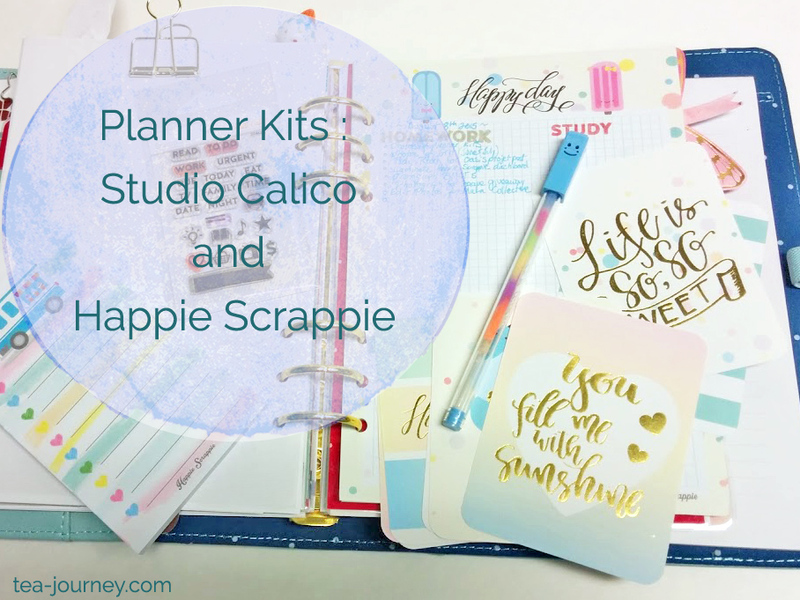 These are great kits that can make planning even more fun by adding a little cuteness to the planner that you use, no matter what format you have. This first planner kit is by Happie Scrappie , Sam, who works with a team to create adorable dashboards and inserts. The kit I have here is the June kit which had a summer Treats theme. Who can say no to this adorable set of goodies? Sam has three different kits to choose from: A5 Size (shown), Personal sized and Fauxdori. What is in this A5 kit? A Happie Scrappie dashboard, 8 Happie Scrappie project life cards, Happie Scrappie note pad, Happie Scrappie planner inserts, fine tipped pen, assorted stickers (including some Happie Scrappie Exclusives), Page flag set, charm, washi tape roll and washi tape sticker sheets. 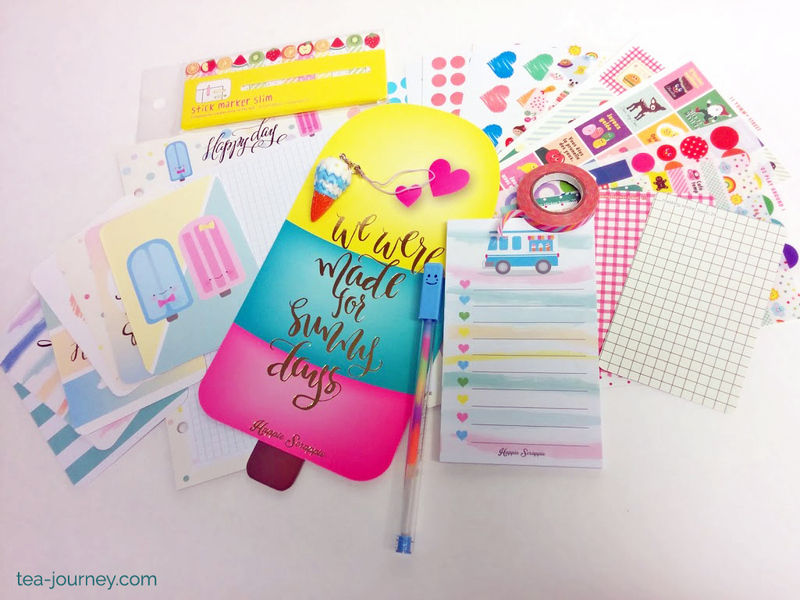 If you are looking for cuteness for your planner then I highly suggest to check out the Happie Scrappie Store to check out the subscriptions and other goodies. Since the end of July I have been looking at Studio Calico, after a pre-order of a personal sized planner…I got on their waiting list for their planner kit. This is July’s Planner kit “Fairground”. I adore the use of of scrapbooking papers and their own systems for creating the “Work Hard- Play Hard” dashboard (I fell in love with the gold foil, can you blame me?). This kit only comes with personal sized dashboards but you can easily adapt it for other types of planners. This kit was packaged in this plastic case when it was mailed out. It is great as I can organize my supplies with it. Included in this kit were: two dashboards (one opaque gold foil paper and one velum), two different sticker sheets, kit exclusive post-its, two washi tapes, a gold binder clip and a kit exclusive stamp set. 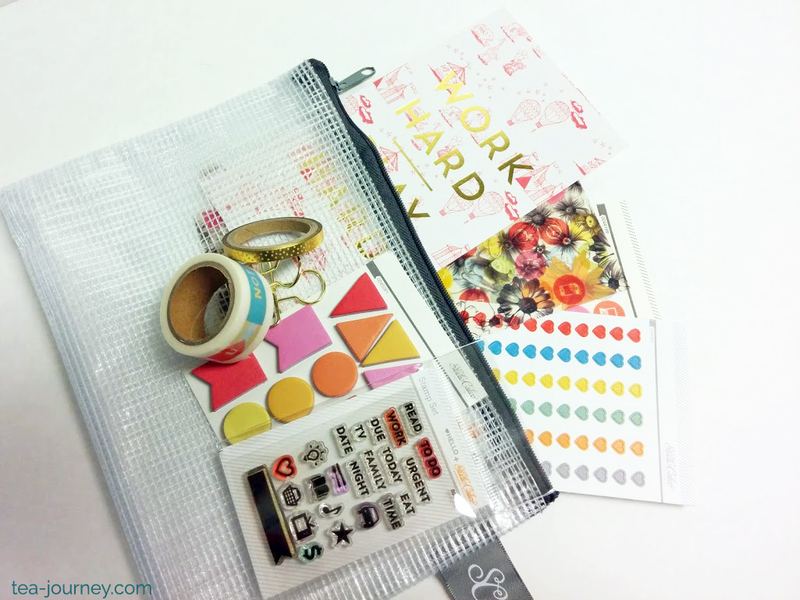 Each months kit has an overall theme (such as August is Pop Art) and has various goodies to help you stay organized and a little crafty with your planner. Studio Calico has various other kits, such as Scrapbooking and Project Life, check out the subscription page for more information. ** All opinions are my own. Both subscriptions are paid by me. Do you use your planner to reach your goals? Share in the comments below! P.S. Feel free to link to images of your planner to share how you keep yourself motivated with your planning. Peace everyone!